80% of Americans are against horse slaughter. You can find the Safeguard American Food Exports Act of 2017 information HERE. Need to find your representatives and their contact info? Click HERE and enter your zip code. Some more great information for those who would like to contact their state assembly person and/or senator and tell them how you feel about your wild horses both in Nevada as well as wild horses across the country – they deserve better treatment than what’s happening to them now. The Cloud Foundation is a website dedicated to updating information on important issues regarding wild horses. 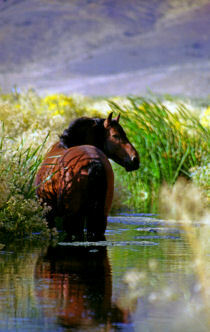 Wild horses are our Western Heritage. This organization reports on efforts to save the remaining majestic animals that roam the wide open spaces. This is a website that reports on the wholesale slaughter of wild horses by killer horse buyers. WARNING: if you are weak of stomach, don't go here.